The new VCA 2017 / 6.0 puts safety even more central, contains improvements in the workplace and safe behaviour and provides more clarity and reliability for the chain. All VCA-certified companies will ultimately be faced with the new standard through a transitional arrangement. In order to obtain the newest certificate, phase 2 had to be fully audited, which required additional preparation and audit time from our employees. Both our handbook and work safety were re-assessed on the amended and new mandatory VCA questions. This includes additional and stricter rules on behavioural awareness and the assessment of the VGM performance of subcontractors. 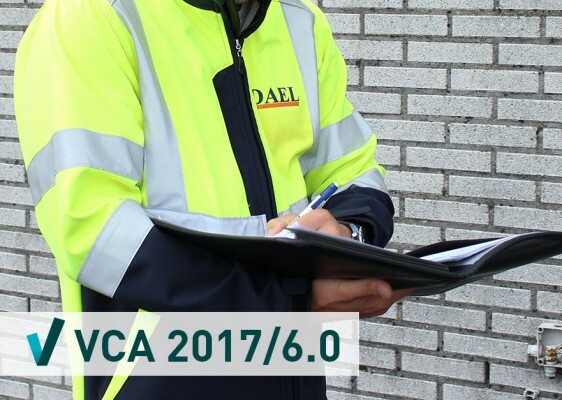 Thanks to the good preparation of our colleagues involved, the DAEL Group once again passed the VCA audit.